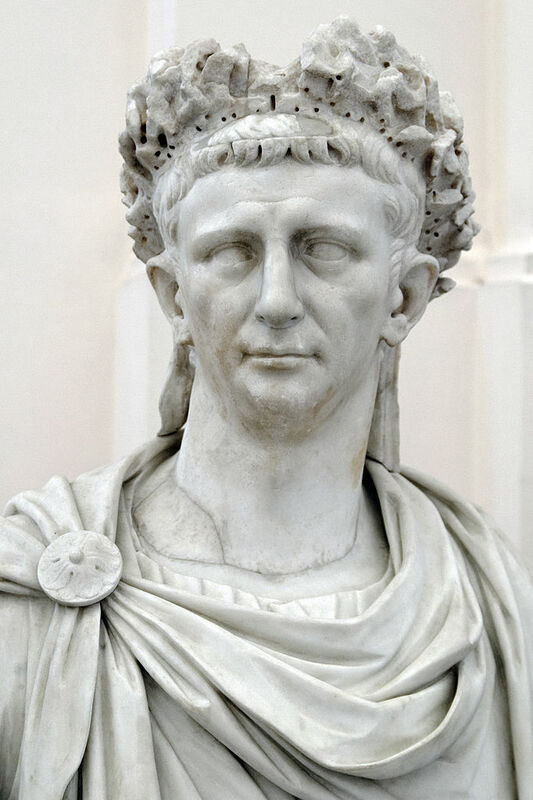 It’s August 1st, and that means it is the Emperor Claudius’ birthday – his 2022nd, to be precise. I’ve always had a soft spot for old Claudius. I’m sure Robert Graves and Derek Jacobi have quite a lot to do with that, but the narrative of the underdog who was sidelined and belittled for years but still became emperor anyway is inherently endearing. I also love the fact that he was a historian, just like me. Right now, in the thick of my research into receptions of Augustus, I would give anything to be able to read the history of the aftermath of Caesar’s death which he wrote (even though he was advised to omit the civil wars between Octavian and Antony which followed). Claudius was born at Lugdunum [= Lyon] on the Kalends of August [= August 1st] in the consulship of Iullus Antonius and Fabius Africanus [= 10 BC]; the very day when an altar was first dedicated to Augustus in that town. Other sources, such as Cassius Dio and the military calendar from Dura Europos also confirm that August 1st was the date celebrated as Claudius’ birthday in antiquity. But that doesn’t necessarily prove that it was the real date of his birth. Everyone, including Claudius, could have been labouring (*boom-tish*) under a common illusion about it. There was no state-controlled system of birth registrations in the Roman empire, and indeed it’s perfectly clear from the ages recorded in documentary texts such as papyri and inscriptions that many people at that time had no idea how old they were or when exactly they had been born. Even within the imperial family that Claudius was born into, it would have been quite easy for a small number of adults to collude in perpetuating a falsehood about his date of birth – and what strikes me in this case is that there were some good reasons for Claudius’ family to want to do just that. What I think is most important about the Suetonius passage, above, is the link which he draws between Claudius’ birth and the altar to Augustus dedicated in Lyon. Firstly, when Suetonius says that Claudius was born on ‘the very day’ (ipso die) that the altar was dedicated, he doesn’t really mean the same day, but the same date. We know from other sources that the altar was dedicated in 12 BC, not 10 BC – so two years before Claudius was born. What Suetonius is saying is that Claudius was born on the exact anniversary of the original dedication of the altar – i.e. August 1st. On one level, that’s just a coincidence, but by pointing out the link between the two events, Suetonius strongly suggests that he thinks it carries some kind of symbolic significance. So let’s talk about this altar. It was the centre-piece of a large sanctuary, where a religious festival in honour of Augustus himself and the goddess Roma was held every year on the anniversary of its dedication – August 1st, as we’ve seen. Each year, the 60 communities which between them made up the populations of the three northern Gallic provinces would send one representative each to a provincial council based at the sanctuary, where they conducted sacrifices in honour of Roma and Augustus led by a high priest elected from amongst their number. In other words, this altar was the most important centre for the imperial cult in the whole of northern Gaul. Agrippa, the son-in-law of Caesar [Augustus], died. A census was organized by Drusus. The Germanic tribes living on this side of the Rhine and across the Rhine were attacked by Drusus, and the uprising in Gaul, caused by the census, was suppressed. An altar was dedicated to the divine Caesar at the confluence of the Saône and Rhône, and a priest was appointed, Gaius Julius Vercondaridubnus. So Drusus has just had to suppress riots sparked off by his organisation of a census. That’s an age-old story, of course. The purpose of the census was to register both people and land-holdings for the purpose of taxation, and this was the first time it had ever happened in Gaul – still at that time a relatively newly-conquered province. In fact, the whole situation is rather similar to the surveys conducted for the Domesday Book in England in the wake of the Norman Conquest. Naturally, the locals were not very pleased at the prospect of suddenly becoming liable for a whole load of new taxes. The Sugambri and their allies had resorted to war, owing to the absence of Augustus and the fact that Gauls were restive under their slavery, and Drusus therefore seized the subject territory ahead of them, sending for the foremost men in it on the pretext of the festival which they celebrate even now around the altar of Augustus at Lugdunum. So the foundation of the altar, and the religious festival which took place there, seems to have been part of a programme of pacification following after the census and the riots which it has sparked. Dio is pretty cynical about Drusus’ behaviour, suggesting that he deliberately called leading representatives from the troubled communities to Lyon in order to get them out of the way and make suppressing the riots easier. Perhaps that was indeed his plan, but the move can also be seen in a more constructive light, especially from the perspective of the communities who were not rioting. Establishing the altar, and the council of community representatives who met there, would have helped to foster a new sense of collective identity for the peoples of northern Gaul, and to ensure that the focus of that identity was firmly fixed upon the emperor and Rome. It drew them into the new social and political order, ensuring that their leading representatives had a regular reason to go to Lyon and meet with the governor, and encouraging them to display loyalty to the emperor and the state while they were there. So from the point of view of Augustus and the imperial family, the altar at Lyon was a very important tool in the careful, gradual transformation of northern Gaul from a fractious collection of loosely-federated tribes into a loyal and coherent Roman province. Picture the scene, then, in 10 BC – two years after the altar was founded. Drusus has just been dealing with another bout of unrest on the German frontier, this time led by the Chatti. Cassius Dio relates that Augustus himself came to Gaul himself during this period, where he was ‘tarrying in Lugdunensis’ while he monitored the progress of the campaigns. In other words, it is very probable that Augustus himself was actually staying in Lyon at Drusus’ family residence. Meanwhile, the annual festival is coming up, the representatives of the sixty Gallic communities are arriving in the city, and Drusus’ wife, Antonia, is heavily pregnant. How very convenient it must have been, then, to be able to announce an imperial birth just at that moment. With the frontiers still needing constant attention, and all hopes of keeping them secure resting heavily on the continuing loyalty of the already-conquered Gauls, what better sign of a bright future could the imperial family wish for? How nice, how neat to be able to announce to the members of the Gallic council, as they conducted their annual worship of Augustus, that a new grand-nephew / step-grandson (for Claudius was both) had been born to him on that very auspicious day, carrying with him great hopes for the future of Augustus’ family – and hence of Rome, and hence of themselves as Roman Gauls. If Augustus was indeed there, perhaps he made the announcement himself, and maybe even held up the howling infant in front of the adoring crowds? How nice, how neat: how rather too good to be true. After all, could you tell the difference between a genuine new-born and a child born, ooh, anything up to a month earlier in an open-air sanctuary over the heads of massed representatives drawn from across Gaul? I know I couldn’t – and given how politically expedient it was for the imperial family to be able to announce a birth on that very day, I can’t help but be suspicious. No wonder they wanted to underline the link, now preserved in Suetonius’ text, between Claudius and the altar. I can’t prove any of this at all. It is pure speculation. And of course it doesn’t matter, anyway. Time is arbitrary, and August 1st is as good a day to celebrate Claudius’ birth as any other. After all we are quite used to celebrating the Queen’s Official Birthday on a date which isn’t actually the anniversary of her birth, but which happens to be convenient. Speaking personally, I’m happy to take August 1st at face value for Claudius’ birthday, because my own birthday is tomorrow, and that makes us birthday neighbours! But I do think it’s a nice example of the fun we can have in the very large gaps between the lines of Roman history – especially if we set off armed with a healthy dose of scepticism. The last is of particular interest to me, of course. Not only is it a bimillennium in its own right, but I think it’s also a rather good example of how anniversary commemorations are all about the values of the societies which hold them, and not anything inherent in the anniversary itself or the historical significance of the event in the context of its own time. The bimillennium of Augustus’ birth was marked with multiple events all over the world: not just the Fascist commemorations in Italy, but exhibitions, lectures, publications and more in the rest of Europe, the US and Australasia. By contrast, Caligula’s big anniversary seems to be attracting relatively little attention. Adrian Murdoch (amongst others) has been involved in making a documentary about him, currently screening in Australia and New Zealand, which is clearly timed to coincide with the anniversary. There is a panel about him today at the SF convention Chicon 2012 entitled ‘A Bimillennial Celebration of Caligula’ (see pocket programme, p. 37). And I’ve also found a post about him at The History Blog and an article at History Today. But that seems to be all – and it is definitely pretty low-key by comparison with Augustus (likewise Vespasian, who got a whole exhibition in Rome for his bimillennial birthday in 2009). And that makes sense. Augustus’ rise to power and overthrow of the Republic may be a little controversial (to say the least! ), but thanks to the efforts of Horace, Virgil, Velleius Paterculus, Suetonius and co. he still occupies a place in the public imagination as a well-intentioned bringer of peace and stability, and champion of the arts. Commendable stuff. 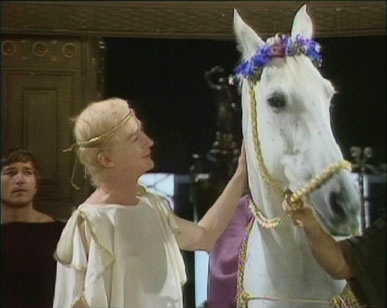 Caligula, on the other hand, is mainly known for wussing out of the conquest of Britain, demanding that people worship him as a god and eating a child born of his own incestuous relationship with his sister. Most of those sorts of stories are clearly lurid exaggerations if you actually look at the sources – e.g. everyone ‘knows’ that he made his horse a consul, but even the gossip-hungry Suetonius only actually claims that people said he planned to do this. Well, I could say that about David Cameron, and there would then be exactly as much evidence that he planned to make his horse (or perhaps Rebekah Brooks’ horse?) a consul as there is about Caligula. It doesn’t amount to much in either case unless they have actually done it. Still, Caligula clearly did rule badly enough, and in particular execute enough prominent people, to find himself at the sharp end of the first ever assassination of a Roman emperor after only four years in power. So he’s not exactly someone you want to run the risk of appearing to celebrate (unless you are a bunch of SF fans having a bit of fun, apparently!). Safer to just stay away from that particular anniversary altogether. Meanwhile, at the opposite end of the spectrum, Blackpool city council have a history which they are so keen to celebrate that today they seem to have invented a suitable anniversary for it. According to their city council, tonight will mark the centenary of their proud history of Blackpool illuminations. But a man on the Today programme this morning (whose name I didn’t catch) assured us that the illuminations actually date back to 1879 – and indeed Wikipedia confirms this. From the same page, I can see that there is a case for claiming 2012 as the centenary, since 1912 clearly saw a rather more spectacular event than had been attempted in 1879 (though in May, not late August). But even the 1912 event was a one-off, and regular illuminations didn’t start until 1925. In other words, there are multiple dates here which could be claimed as ‘anniversaries’ of one sort or another, and of course what the council is really trying to do is simply take advantage of one of them in order to drum up interest in the lights. (It’s clearly worked, too – this item has been all over the news today.) Given the arbitrary nature of time, none of these dates is really any more closely connected to the first illuminations than any other. But the debate on the Today programme this morning showed that any anniversary does need to have a convincing air of authenticity about it to make it ‘work’ as a mythic point of connection with the past. Rather like Father Christmas – or indeed Christmas itself – these things only exist if we believe in them. Two years from today will mark the bimillennium of the emperor Augustus’ death, which took place on 19th August AD 14. I have been busy so far this summer getting started on a new research project all about that event, so today seems like a good day to say a little bit about it. We have a real fascination with ’round-number’ anniversaries in western culture. Examples from this year alone have included the bicentenary of Charles Dickens’ birth, the centenary of the sinking of the Titanic and of course the Queen’s Diamond Jubilee. On one level, of course, the apparent roundness of 60, 100 or 200 years is completely arbitrary. It relies on dating and numbering systems which we have invented, and we all know rationally that the 19th August 2014 bears no closer relationship with 19th August AD 14 than does the 18th August 2014, the 20th August 2014, or indeed any other modern date. But the basic similarity between two dates which are separated by a perfect round number like 2000 has a strong psychological effect. We even use phrases like ‘on this day in history‘ to speak of anniversary dates as though they somehow occupy the same day as the original event, in spite of the many years which have actually passed between them. The coincidence in the dates creates a sort of short-cut or wormhole effect, making us feel as though we are closer to the original event on its anniversary day than at any other time. This makes anniversaries into powerful tools for connecting with the past, looking at its relationship with the present, and thinking about the dialogue between the two. The particular way in which an anniversary is commemorated is far from neutral, though. They usually speak volumes about contemporary interests, priorities, social structures and political relations in the societies which celebrate them. And the bimillennium of Augustus’ birth on 23rd September 1938 offers a very vivid example of that. Famously, Benito Mussolini used it to boost his own political status and promote a particular vision of Italy’s national identity and future. Mussolini’s political position was comparable to Augustus’, in that both had transformed quasi-democratic constitutions into effective dictatorships with themselves at the head – and in both cases they had done it in Rome. But Augustus had managed to pull it off to widespread contemporary acclaim, while being the head of an extensive empire to boot – and Mussolini wanted in on that. He made every possible effort to signal the parallels between them, and the bimillennium, with its strong sense of connection between past and present, was a perfect opportunity for doing so. The event was celebrated on a grand scale, including an exhibition (see poster to right), the clearance of Augustus’ Mausoleum and reconstruction of the Ara Pacis, academic publications, the issuing of stamps, coins and more. All of this was designed to push the association between Mussolini and Augustus, while also encouraging contemporary Italians to develop a sense of national pride and a belief in the virtues of hard work which would neatly serve his imperialistic agenda. Not all anniversaries are quite so blatantly politicised, of course, but they all inevitably say something about the society which commemorates them. So it is with that idea in mind that I want to use the forthcoming bimillennium of Augustus’ death to explore what he means to people today, some two thousand years after he died. Part of my plan is to hold a major conference on and around the date of the bimillennium itself, which will take as its prompt the format we usually use for thinking about someone who has just died: the obituary. The conference will look at the close of Augustus’ life and his death, consider his life as a completed whole, evaluate his impact and think about the legacy he left behind. But because we are ‘writing’ this obituary two thousand years later, we will also examine that legacy as it has played out over a period of two whole millennia, trace evolving evaluations throughout that period and think about what is at stake when we formulate our own judgements of Augustus’s life and career. Once the conference is over, I’m hoping to publish an edited collection of papers arising from it, while in parallel I will also be researching and writing a monograph of my own on the subject of the bimillennial commemorations, and what they reveal about Augustus’ position in contemporary thought and culture. 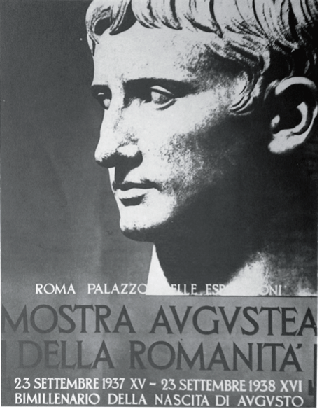 The monograph will look at both of Augustus’ big bimillennia: his birth on 23rd September 1938, and his death on 19th August 2014. No matter how sternly I try to steer myself away from the silly word-play, I can’t help but think of these as the ‘natal bimillennium’ and the ‘fatal bimillennium’ respectively, and I’ve a feeling those terms are going to stick now. Certainly, they’re quicker to say or type than ‘the bimillennium of his birth’ and ‘the bimillennium of his death’. Anyway, I’m planning to explore how both were / will be celebrated, as a means of identifying the main ideas and values associated with Augustus in each period, and exploring how he (as a symbol of those ideas and values) gets used and abused for contemporary purposes. This should be a good way of assessing the historical significance of Augustus two thousand years after his life-time, and will also offer the opportunity to trace smaller-scale changes in how people have thought about Augustus between the two anniversaries in 1938 and 2014. One thing I have certainly already discovered is that the natal bimillennium was commemorated by far more people and in far more places than just Mussolini in Italy. I’ve uncovered exhibitions, competitions, plays, lectures, academic publications and more – so far mainly in the USA and UK, but that is partly simply because I have started by running my searches in English. I’m sure more will emerge once I move on to French, German, Spanish and so forth. Some of these events intersected with Mussolini’s, and there is certainly an interesting story to be told there about the degree to which academics in what would soon become Allied countries were and weren’t prepared to cooperate with him in the run-up to the war. It’s rather more than you might expect with the benefit of hindsight. Meanwhile, people’s reasons for being interested in Augustus outside of Italy in 1938 seem to have hinged around a sense of his impact on the development of western civilisation. There is a great deal of talk of achievements such as the establishment of a peaceful and prosperous empire which formed the roots of modern Europe, the essentially Latin (as opposed to Hellenistic) character of that empire thanks to his victory over Antony and Cleopatra, and the patronage of literature and the arts. Although scholars in this period were willing to criticise the means by which he achieved sole power at Rome, there is also a strong sense that the ends justified the means, and even a willingness to write apologiae for his more unpalatable acts – for example by claiming that Rome was hardly a democracy before his rise to power anyway, so it doesn’t really matter if he then transformed it into a monarchy! Yet in the middle of it all there is Ronald Syme, about to effect a profound change in contemporary views of Augustus. At the time of the natal bimillennium he was going round beginning practically every book review he wrote with sentences like “A memorable and alarming anniversary looms heavily upon us” (that one’s from The Classical Review (1937) 51: 194), and proceeding to criticise other people’s efforts to assess Augustus’ career. Responding more astutely than anyone else around him to the tide of political developments in continental Europe, he was about to raise serious questions about that balance between means and ends. Few people since have been willing to argue that Augustus only did it all for the greater good. With Syme, our actual experiences of 20th-century dictatorships, and another half-century of western democratic nations positioning themselves against first Communist and then Middle Eastern dictatorships under our belts, I’m pretty sure the bimillennium of Augustus’ death will be marked quite differently from that of his birth. After all, we are basically talking about a guy whose biggest achievement was to overthrow the Roman Republic and install himself as an absolute monarch. Not a very palatable story in the early 21st century. But we can still engage with Augustus without needing to eulogise him. We can certainly cast all sorts of light over our contemporary political landscape by examining the combination of brute force, rhetoric and careful public image-making which he used to persuade contemporaries to accept – and even welcome – a trade-off between their security and their civil liberties. Some good documentaries could be made exploring his political techniques, their parallels in the modern world, and what the degree of similarity or difference tells us about our own system. But I will just have to wait and see what, if anything, actually happens for the bimillennium – apart from my own conference, of course. In the meantime, I am busy getting stuck into the planning for that – contacting key speakers, arranging a suitable venue, and putting together some funding applications. I’ve got some very exciting people lined up already, who have promised some very interesting papers, and I’m starting to feel pretty pleased by how everything is falling into place. But I suppose I need to wait until the ‘behind-the-scenes’ details are fully organised before I am in a position to announce it all formally. I can certainly say that any major developments will be covered on this blog, and that I’ll be circulating an open call for conference papers at least a year before the event itself. And if there is anyone else out there planning something of their own for Augustus’ ‘fatal bimillennium’, do get in touch. (A comment on this post will reach me, or further contact details can be found here.) I certainly want to know about anything which museums, TV production companies, publishers or Classical societies might be doing to mark the event. Half of what I want to do over the next two years is engage with those sorts of activities, get a sense of what you are doing and why, and maybe contribute myself if that’s appropriate. And if there are other academics developing research work of their own around the forthcoming bimillennium, I’m keen to hear about that too. Maybe you’d like to contribute a paper at my conference, or if you’ve been planning a conference of your own, perhaps we could join forces? I would certainly much rather collaborate on one big conference than have two competing events happening in different places on the same day. I’ve started this project off by myself so far, and I have my own clear ideas about what I want to do. But it also feels to me like the sort of thing which has a great deal of what funding bodies call collaborative potential – both within and beyond academia. I’d certainly smile if Augustus’ real bimillennial legacy in 2014 was to inspire a project that was all about cooperation and sharing.